The Dual Shaft Mixer includes an Anchor agitator and a High Speed Disperser. The anchor feeds product into the high speed disperser blade and ensures that the mixture is constantly in motion. 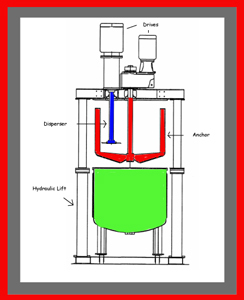 The anchor can be provided with scrapers to remove materials from the interior vessel walls to enhance the heat transfer capabilities of the mixer. Both agitators are available for variable speed operation. A second high speed dispersion mixer can also be added for increased shear. Multiple blades on each of the disperser shafts can also provide added mixing. To request a brochure for the Dual Shaft Mixer , please completely fill out the following form. You will then have access to download the brochure in PDF format or to request that one be mailed to you. What is the final viscosity (cP) and density of your product? What materials of construction are preferred for product wetted components and for external components? For example: painted carbon steel, type 304 stainless steel, type 316 stainless steel or Hastelloy? Specify the polish required on stainless steel components. For example: mill finish, 80,120,150,180,240 or 320 grit. Do you want to operate under vacuum or pressure? If yes, please advise vacuum/pressure ratings. Do you want sight ports, charge ports or other nozzle connections in the vessel cover? Please advise how many and the preferred size. Do you want to include a jacket on the mix can for heating or cooling? If yes, please advise the jacket pressure and whether an ASME code stamp is required. Do you want a discharge valve in the bottom of the mix can? What size and type? Is this a new mixing operation or are you updating an existing process? What type of mixer are you currently using? When will a mixer be required for this project? Shorten your dissolution time by switching to a multi-agitator mixer.